Brisbane City Council have provided $52 000 in funding for the 2018/19 year, to subsidise cat desexing for residents in need through AWLQ’s NDN Cooperative Desexing Program. Residents will pay just $35 to desex a male cat and $55 for a female cat. To help people with many undesexed cats, additional female cats will only be $35. Residents in need can phone NDN on 55099044 to find out if they are eligible to receive a voucher for one of 30 participating vet clinics in Brisbane. NDN thanks the 30 clinics across Brisbane who are helping to provide this community service. Deputy Mayor Adrian Schrinner said that residents could help reduce the number of abandoned pets by taking advantage of Council-funded discounts on pet desexing. “Council supports responsible pet ownership to keep Brisbane a great place to live, work and relax, which is why we are supporting the Animal Welfare League’s Getting 2 Zero program,” Cr Schrinner said. 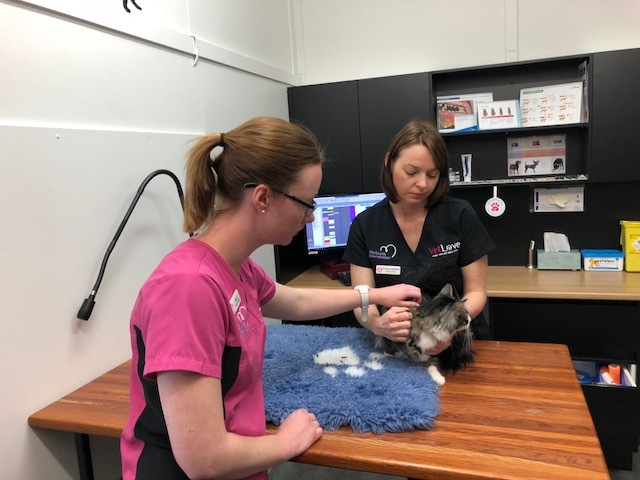 “Brisbane is a pet-friendly city and home to 145,000 family cats, however part of being a responsible pet owner is ensuring these cats don’t have unwanted litters, to reduce the number of stray and abandoned animals. Lifestyle and Community Services Chairman Cr Peter Matic said cats were natural predators and could cause serious harm to native wildlife, in our clean, green and sustainable city. “Council received more than 700 complaints about feral cats last year, with more than 800 captured on Brisbane streets,” Cr Matic said. For more information about the Brisbane Cooperative Desexing Program, or to apply for a voucher, phone 55099044. Hi Tina, we do not have any participating Vets near Bribie Island. We do have Vets in Morayfield, Narangba, Beerwah,Kallangur and Sunshine Coast offering discount desexing to concession card holders. Please apply for a voucher online at our website or contact us on 1300 368 992. Hi Daniel,we do have participating Vets nationwide offering discount desexing for dogs. You do need to hold a concession card. The Vets are not subsidised by Councils. If you do hold a concession card please apply for a voucher online at our website https://www.ndn.org.au or contact us on 1300 368 992. Hi Crystal, we are not running any desexing programs for Logan City Council however they do offer their own program. Please contact them for more information. We think you do need to hold a concession card to be eligible for discount. Regarding the kittens, you are probably aware all Shelters and Rescue Groups are overflowing ! You could contact Animal Welfare League Gold Coast and put the kittens on the waiting list. Their contact number is 55099000. You could also try Little Paws Rescue in Loganlea but we think they are not taking any at present. Please do not advertise them on Gumtree or Facebook as there are not happy endings for lots of these kittens ! Is there anything going like this in the Moreton Bay Region at all. Hi Raquel, we are not running any programs on behalf of Moreton Bay Council however we do encourage you to contact your Council and ask them or organise one. We do have a few participating Vets in Moreton Shire offering discount desexing to concession card holders however their prices are not as low as Council subsidised ones. If you hold a concession card please apply for a voucher online at our website or contact us on 1300 368 992. Is there a list of participating vet clinics? Trying to find one close as possible to brisbane city. Hi Sam, we do have participating Vets in Brisbane Council area. Please contact us on 1300 368 992 and we will assist you. Please you still have vouchers? Tanks. Hi Nancy, are you referring to Brisbane Cooperative cat desexing program ? If so, yes so please phone us on 5509 9001 to see if you qualify for a voucher. Hi Andrea, it depends if you are in one of the Council areas offering subsidised desexing programs. Please provide your town and postcode and we will advise you. Alternatively please contact us on 1300 368 992.